Many traders have heard of Advance Decline Line. It is even reported in major financial news media. Most of the time, people focus on the divergence of the index levels against the Advance Decline Line as signals to potential trend change. This is not quite what the breadth indicator is designed for. I will explain in details what advance decline lines really are and how to use it properly in your own trading. To understand Advance Decline Lines, you have to know the definition of Net Advance Decline Issues. 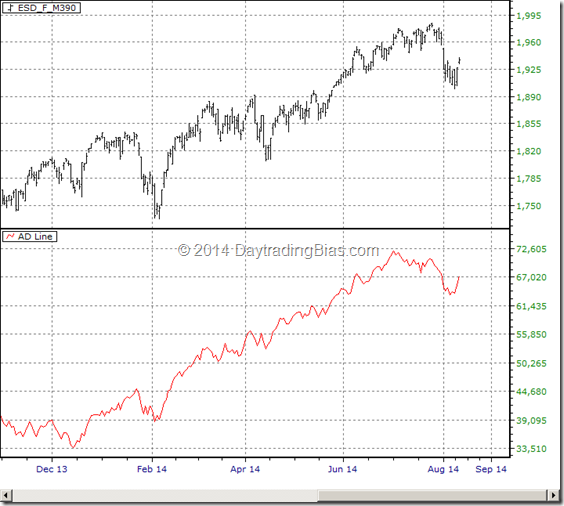 Net Advance Decline Issues is the net difference between advance issues and decline issues for a trading day. Advance Decline Line is simply the continuous accumulation of Net Advance Decline Issues. Depending on the collection of advance decline issues data, you get completely different advance decline lines. For example, if your advance decline issues data is collected from NYSE, you get the NYSE advance decline line. If your advance decline issues data is for Nasdaq, you get the Nasdaq advance decline line. Obviously one can also restrict the basket of symbols to gather advance decline issues to, say, the S&P500 only. In that case you are producing the S&P500 advance decline line. The concept is quite simple. 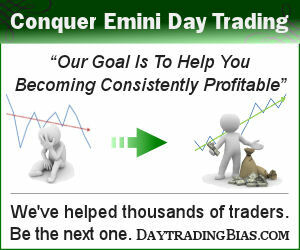 Following is a chart of daily Emini S&P with the NYSE advance decline line below. The advance decline line is a choppy line because the daily changes in the number of issues going up or down can be drastically different from the day before. The extreme changes happen more often when the stock market is in a tight range and when the stock market jumps out of the range from the previous trading days. It creates a unique problem for those people who try to interpret the raw advance decline line because a turn happened on a single day can be invalidated the very next day. Another problem with the advance decline line is that it is designed as an ongoing calculation. As an ongoing calculation, the AD line absolute reading depends on the duration and the day your calculation starts from. In other words, the exact value of advance decline line is meaningless. Constructing indicators has been the business of the financial industry. 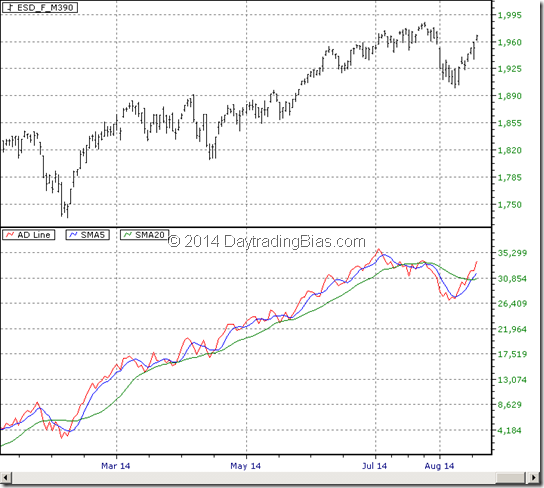 It is not limited to just technical indicators based on price or market breadth. All these so-called financial ratios constructed from financial statements and economic indicators constructed from data collected about the economy are also indicators. They are often created without people questioning what they represent and what they really are. Hence all the pseudo-science followed from the interpretations of these indicators. So think for a second what Advance Decline Line really is. Advance Decline Line is the accumulated up down votes from the underlying companies (or just components if the breadth is collected on non-stock based basket) without the weighted calculation process applied like the construction of stock market indices S&P500 or Nasdaq 100. For example, when the NYSE net advance decline issues for some trading days is +100, the S&P500 index could be up 5 points on some of them, up 10 points on the others and even down a few points in some occasions. In other words, Advance Decline Line is the normalized net change where the components are all weighted at 1, not market capitalization or their absolute price levels. It is important to keep this in mind when one is going to interpret the information derived from any advance decline issues related statistics properly. When the net advance decline issues has a strong reading (high positive value) while the index net change is strong too, it is a confirmed bullish move. When the net advance decline issues has a strong reading while the index net change is weak, it is potentially bearish. When the net advance decline issues has a weak reading while the index net change is very weak too, it is a confirmed bearish move. When the net advance decline issues has a weak reading while the index net change is relatively not as weak, it is potentially bullish. Since the Advance Decline Line is the accumulation of the Net Advance Decline issues, it is the approximation of the potential longer term implication of strength / weaknesses in the related market indices. The operative keyword here is approximation. To get the exact measure for a specific duration, one can actually figure out the exact net advance decline issues for the whole period (e.g. 5-Day Advance Decline Issues) for better statistical comparison against historical data. Remember that Advance Decline Line was invented back in the days when computers were running at thousandth the speed of the computers we have available now. The ability to dynamically collect thousands of market breadth statistics was not feasible. Hence Advance Decline Line was invented as an attempt to get a tool for longer term forecast. It works in the old days because market reactions were much slower. At this computer age, the advance decline line is no longer offering the same level of forecasting value. Following is the chart of Emini S&P together with the AD Line, its 5-day simple moving average and 20-day simple moving average. Notice the strong directional move of the AD Line’s 20-day moving average has highlighted majority of the overall up drift of the Emini S&P from March to July 2014. Every dip during that period is confirmed by the 5-day moving average as minor pullbacks. It is the primary usage of the AD Line for discretionary trading and as a mechanical filter. AD Line works best as a trend confirmation tool when a strong trend in its longer term moving average is established. As a trend confirmation tool, AD Line suffers the same type of problems like any other trend confirmation indicators. Look at the period between March and May 2014 on the chart above. The 2-way swings cannot be captured using AD Line because the speed of these swings are much faster than the daily advance decline issues changes. In other words, a significant portion of these moves happens intraday and requires timing at the intraday level to pocket these moves. On the same chart, I have marked 4 important price extremes for discussion below. The 2 major price peaks are not accompanied by the same formation in the AD Line. The first one (marked by red down arrow) is a new high in price and the AD Line, the correction back then was fast and no forewarning at all from the AD Line reading. The second one (marked by orange down arrow) can be labelled as having a negative divergence of the AD Line from the price. But it is not clear what the engagement should be to rip the profit from the setup. If negative divergences of the AD Line are treated as trading signals, one has to filter out majority of them through other means (e.g. price patterns) before the signals are profitable. 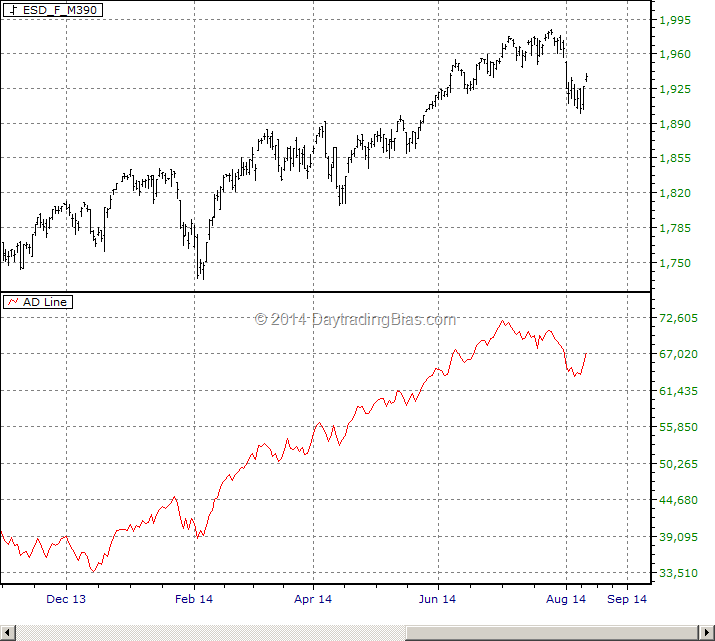 The 2 major price troughs on the chart do not show any signs of divergence either. One can argue that the drops should be contained because of various reasons derived from the AD Line, like, the AD Line has been moving in a tight band so a 2 deviation move is oversold. Such argument is the same as a financial analyst claiming PE ratio of 11 is a cheap level to buy. Both are make up reasons to support an opinion, not scientific study of the behaviour of the AD Line. The truth is, AD Line was never this stable over a 6 months period in its history. Advance Decline Line is not a good tool for pinpointing the turning points in the stock market indices – not in the past nor in the present. Advance Decline Line is a simple extension of the advance decline issues hoping to provide market breadth reading on the longer term overall health of the stock markets. It was designed at a time when computation power was very limited. It still has its usage and its place in market breadth analysis but the forecasting value of AD Lines is not that good any more due to the sheer speed of price movements in the stock markets has outpaced this breadth indicator. An updated version of AD Line should help improve the accuracy and timeliness of this classic breadth indicator.